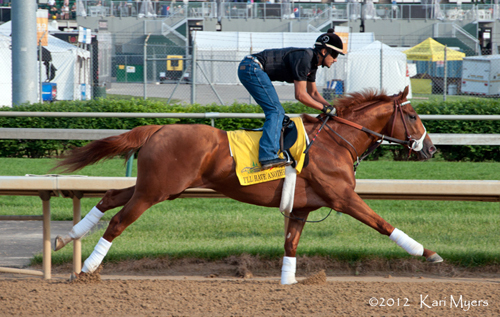 May 3, 2012: I’ll Have Another gallops a few mornings before his Derby win. I freely admit that I’ll Have Another was not my pick in the Kentucky Derby this year. Not my third or fourth, either. However, I’ve always liked his sire Flower Alley and I have all the respect in the world for Three Chimneys where he stands at stud, so I’m learning to live with it. It’s just that I had my dream trifecta all set up: Bodemeister, Union Rags, and Dullahan. I guess two out of the three isn’t all bad, right? This was the second Kentucky Derby I’ve attended, and my friend and I decided that we’d just get a general admission ticket and hang out in the paddock all day for the Derby. That’s exactly what we did, and that’s exactly why I’ll never do it again. Ever. I stood in one spot from 8am until 7pm without going to the bathroom, getting a drink, getting out of the beating sun, or even sitting down. Why? Why would someone do something that insane? Because I absolutely refused to give up my spot at the paddock rail! It gets so crowded that many times you’d never make it back to the paddock at all, let alone to a rail spot. I stood there and suffered so I’d have the best view I could manage, and boy did I pay for it. Lesson learned. I’ve already bought my seat for next year’s Kentucky Oaks and Derby. Oh, and did I mention that it was the largest crowd in Kentucky Derby history? 165, 307 people piled into Churchill Downs the first Saturday in May of 2012, and I think that every single one of them was in front of me as I walked back to my car. Try spending an exhausting day like that at the track, then walk up the bridge and down to your car at Cardinal Stadium with all the drunk kids from the infield staggering around like zombies in your path. Not an ideal way to wrap up the day. It’s all worth it in the end, though–even if my horses lost. There’s no experience quite like Churchill Downs on Derby day!